A murder committed. A love lost. A ghost haunted by his past. 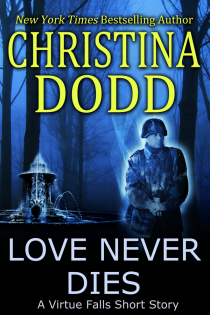 Buy LOVE NEVER DIES on Kindle, Nook, Kobo and iBooks. At the knock on her open office door, Kateri Kwinault looked up. A young, attractive female waited there. Sheriff Garik Jacobsen stood behind her and at her left shoulder. Garik looked relaxed and slightly amused. Or maybe bemused, so Kateri knew whatever brought this young woman into the Virtue Falls library was nothing too serious. On the other hand, after he ushered woman in, he stepped inside, shut the door, leaned against the wall and folded his arms. So he was interested in what happened next. Kateri stood and extended her hand. "I'm Kateri Kwinault, the librarian here in Virtue Falls. Can I help you?" In a single glance, the young woman accessed Kateri's disabilities and gently clasped her fingers. "I'm Areila Leon. I went into the police department to tell them how much I appreciated their official presence in Eugene Park earlier tonight and the sheriff suggest we come and talk to you. Although I don't know exactly … why…." Kateri flicked a glance at Garik. She was beginning to understand and she wanted to ask when she had become Virtue Falls's official woo-woo expert. But she knew the answer, so she gestured at one of the cheap plastic chairs. "Won't you take a seat?" When Areila was sitting, Kateri eased herself into her own chair. "Now — you say you saw someone in Eugene Park tonight?" "Two somebodies. I'm an intern with the Banner Geological Study—"
Kateri nodded. No one visited Virtue Falls in the dead of winter unless they were an intern with the geological study or a medical supplies salesman. "—And when I finished my job it was five and dark, and I was in a hurry, so I crossed through the park." Areila must have seen the expression on Kateri's face for she explained, "It's the fastest way home. There's a homeless guy who's been there a couple of times before. I don't mean to cause him trouble, usually he seems simply … sad. But this time he started harassing me. He was in my face, asking where I had been, what I'd done with the kids." Areila's voice was steady, but Kateri's could see the slight tremble in her fingers. Kateri asked, "Tall guy, bulky shoulders, fingerless gloves, smells like BO and pine needles?" "That's him," Areila said. "What's wrong with him?" Kateri met Garik's gaze. "Cleardale's off his meds again." "I've sent one of the guys to pick him up," Garik said. "Miss Leon, are you sure you don't want to press charges?" "No, really. As soon as he saw your officer, he turned and ran. He seemed really frightened and your officer wasn't doing anything, just standing there. Why was he so afraid?" Kateri answered. "I would guess he was afraid because the police didn't have a presence in Eugene Park last night at five." "I'm afraid not," Garik said. Areila looked at the two of them as if she thought they suffered their own version of mental illness. "But he wore a uniform. So I thought —"
"Are you familiar with World War II uniforms?" Garik asked. "The greatest generation. Sure." Areila thought that over. "Are you saying there's some guy in Virtue Falls who wears a World War II uniform and hangs around the park rescuing ladies in distress?" Areila let go a long, pent-up breath. "Pardon me, I don't want to put down your town, but there are some weird people here." "Well, yes," Kateri said. "We have our share of eccentrics. But I believe you've had an encounter with our town ghost."